Making jury duty entertaining is almost impossible, unless Pauly Shore is involved, in which case you can forget about "almost". Taking a different approach, buuuuddy, JabberJury. Launched today by a Chi duo seeking a more entertaining, expedient form of conflict resolution, JJ's a forum where folks can air their grievances via video, then have their arguments settled by a jury of their peers, but not a jury of their Piers -- who died and made that guy King?!?! 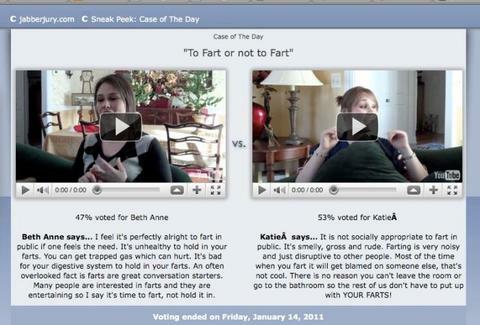 Any two parties with a gripe or dilemma can upload videos stating their case (even calling witnesses and submitting evidence if they so choose), while the jurors -- i.e., anyone with an internet connection/free time -- can weigh in with messageboard outbursts to influence others until the voting ends and the verdict is rendered, at which point...JabberCourtOfAppeals! As a bonus, anyone who posts a winning a case, picks the winning side as a juror, or simply invites friends to sign up earns rewards called "Jabbies", which can be redeemed for prizes or donated to charity, but what the hell is a homeless kid going to do with a switchblade comb? While in trial mode they held debates on topics from acceptable levels of roommate messiness to whether or not it's okay to fart in public -- though if you smell something funky and Pauly Shore's around, don't worry, it's just Jury Doody.